'Oak Point', the Harrison Williams estate originally built for Winslow S. Pierce and designed by Babb, Cook & Willard c. 1903 with Delano & Aldrich alterations c. 1926 (for Williams) as well as the addition of a playhouse. Williams was president of North American Holding Co. which controlled a very large portion of the public utilities in the United States. 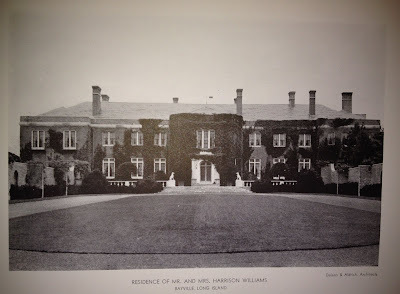 Williams purchased the estate the same year he married Mona Strader. The house was demolished in 1950. Click HERE to see where 'Oak Point' stood on google earth. Still a ponderous hulk but much more refined. The landscaping DID help, along with some architectural adjustments. Does anyone know if there was still a two story central hall? I was wrong – they did not reduce that middle bulge where the front door is but at least they covered it in ivy & put in some appropriate landscaping. I keep trying to squeeze that new staircase into one side of the center door bulge but don’t think there was room … so I wonder where it was? Thanks for the before & after Zach. DED, how did your lecture go? If you ever video & post one of your lectures I hope you’ll let us know. They got rid of the main entrance and main hall, the only two redeeming aspects of the old house...still not very impressive. Sorry, hit publish too soon -- yes, much better looking now & it appears most of the alterations were indeed cosmetic. ANOTHER house torn down to reduce taxes! I understand the reason but still think it's sad because this house was not over-sized for more modern living. For what it's worth regarding modern living...Spinzia lists the house as having eighty (80) rooms. re: Bulging architecture, a quick history lesson. The projecting center pavilion, or 'bulge' on the original Oak Point is a direct reference to similar features on Tudor buildings. In the day, the it would have been known referred to as a porch, although it bears no resemblance to what we call. The porch nomenclature survived into the early 19th century, and many an old New England house has an enclosed entrance pavilion, referred to in its own time as a porch, though today we'd call it a vestibule. Sometime around then, what the same people then called a veranda started being called a porch. And there you have it. Although clothing is typically not of interest to me, I came across an amazing book very recently published on the Spanish designer Balenciaga. Mona Williams was one of his best and most devoted clients, and the photos of some of the clothes he made for her are jaw dropping. The Mona Bismark Foundation also published a wonderful catalog of an exhibit it staged several years ago entitled "Bismark, Balenciaga and Beaton" containing a series of photos of Mona Bismark, in her Balenciagas photographed by Cecil Beaton at her Paris apartment. It's well worth obtaining a copy if you're interested in such things, although it's seulement en Francais and will make you wish you'd paid more attention to Mme. Marescot in 8th grade. 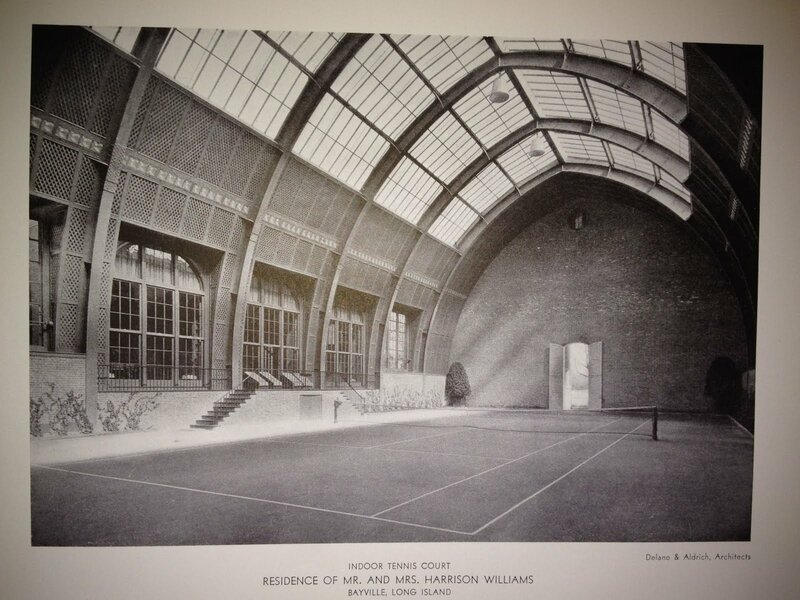 By the way, I remember being told, or reading that the main house at Oak Point was closed prior to the Second World War and that the Williams' moved into the tennis court building which had been converted to a sort of conservatory-atrium, and that after Harrison William's death, the place was shut down, with the greenhouse and garden produce offered for sale at the front gate. Back in the Seventies, a group of scientists working for Arthur D. Little succeeded in making a silk purse out of a sow's ear -- literally. Delano & Aldrich seem to have worked a similar miracle. If Oak Point is still a few bricks shy of a silk purse -- the windows could be better -- it's certainly no sow's ear. And I meant conservatory-aviary: apparently, it contained a collection of exotic birds. Like many "world's richest people" before and after, Williams was highly leveraged and was badly hurt by the Depression, hence the closing of Oak Point. Ancient- thanks for the link. Many of us have been having off site conversations about dates here. Confusing the issue is that several sources give conflicting dates, or at best, are confusing playhouse and main house in their own accounts. After much roaming around google, I find a supreme court decision summarizing Mona Williams Bismarck Etc. 's lawsuit against Bayville in 1963, when she was attempting to sell. 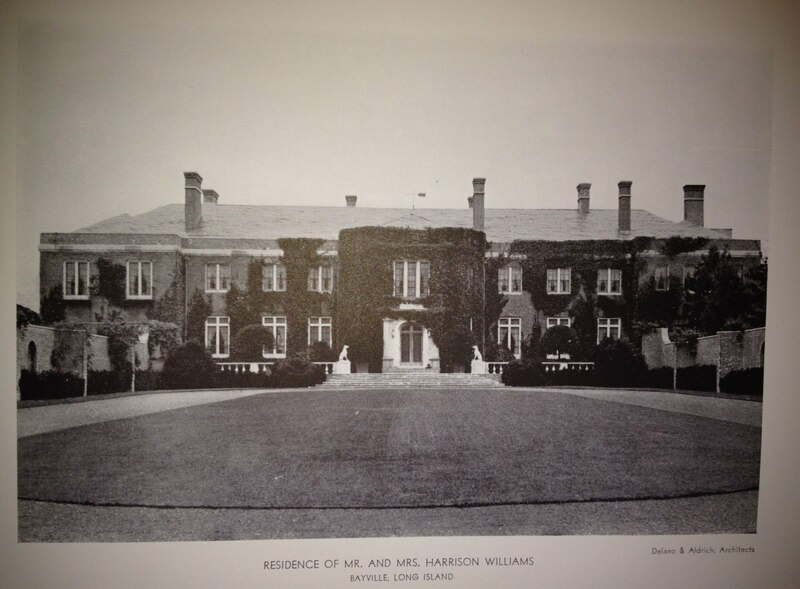 The main house was demolished in 1950. Countess Bismarck inherited in 1951. She ceased living there in 1955. And the 1968 demolition date is the playhouse. The dates and costs in acquiring and developing the estate are also given---staggering translated for inflation into today's dollars. $750,000 was paid when the estate was purchased from Pierce, final investment after additional land and the Williams's many improvements totaled nearly 4,000,000. And don't forget that Mrs. W. spent a minimum of $50,000 a year on clothes, in an age were $50 a week was considered a fine starting salary. Thanks for all that DED. DED what of your photos of the playhouse as residence? Do share with the class! 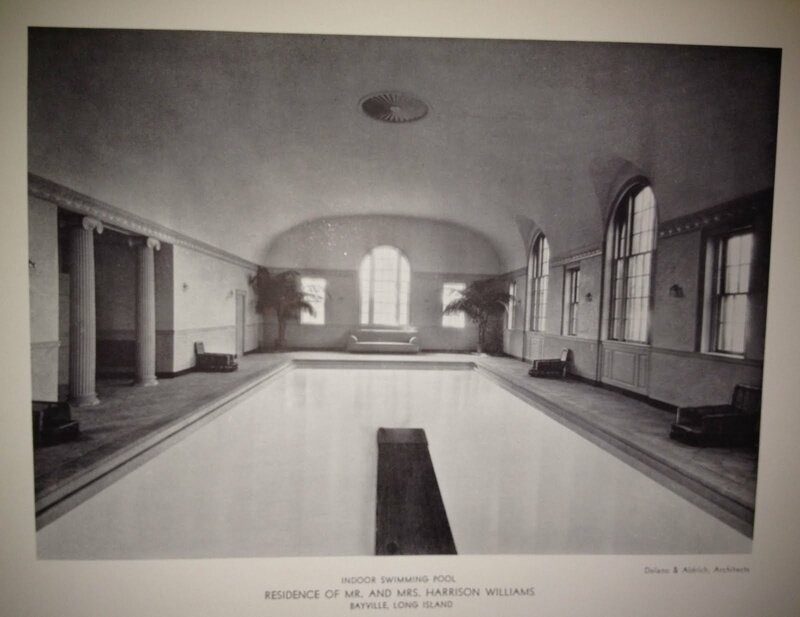 An Aesthete's Lament had further info on the Villa but that has since been deleted. Are you out there??? I have a number of photos of the William's Palm Beach home that I will include in my soon to launch blog. HPHS, For what it's worth I was in the Palm Beach house just before the Wrightsmans sold it to Leslie Wexner, who in the time-honored tradition of moguls everywhere, promptly knocked it down. Now I believe Donald Trump owns the absolutely staggeringly awful place that replaces it? 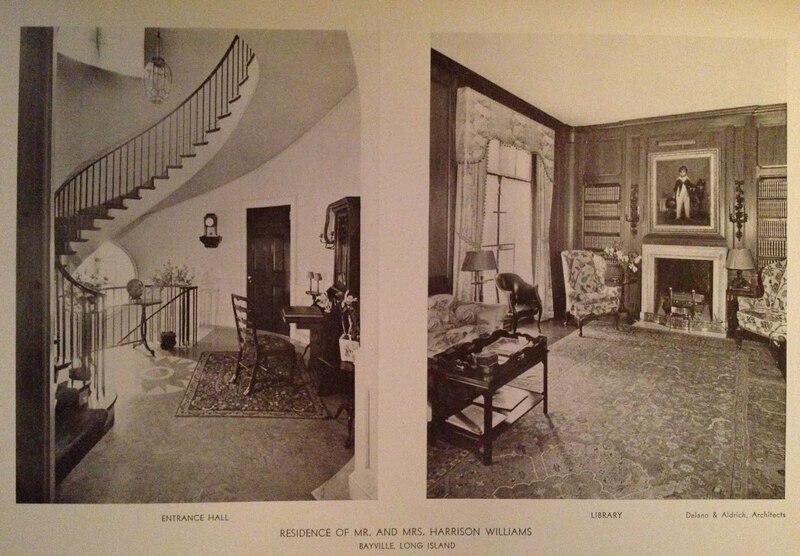 The drawing room was just as beautiful as billed. Extraordinary. Maybe a little ponderous, but kind of stately. Bet it was just what she was looking for. Great to have a follow-up post showing the transformation of the house - really interesting to see! Had heard about Oak Point for years but never have seen a decent picture of it so thanks!! Down East - I'm sure your talk went fine & you knew everything already so polishing was already done! Thanks for the pics too. HPHS -Thanks for all the great links. Really wondered which one was the Capri villa - so finally you provided the link!! She must have been something else. Much of the landscaping and some ruined buildings survived well into the 1970's, providing a wonderful if technically forbidden-by-parents place for local teens to hang out. Among these were a rock garden surrounded by a brick wall with with a keyhole shaped entrance and a wishing well in the center; slate roofed brick potting sheds and the remains of the ballroom building; which had a floor that covered a swimming pool (see the movie It's a Wonderful Life for an example of such.) One graystone, slate roof caretaker's cottage still existed after the Oak Point Woods subdivision was built starting late 1970's. Main entrance pillars and a brick wall along Bayville Avenue also existed into the 1990s but appear to have been torn down.The carriage house, stables and coach/footman quarters still exist and serve the village as the public library, town hall, village museum and meeting rooms for scouts etc. Behind the carriage house is an ice skating rink beloved by generations of local kids.We lived in Bayville at the time and I was told by my father there had been a "gentleman's agreement" that Harrison Williams would sell the beachfront to the village for a public beach, however his widow (Mona) and same-named son (a NJ politician) reneged on the deal and it was unenforceable as not in writing.